15/11/2018 - A Message from new union President. 16/08/2018 - Annual Mass for deceased staff & past pupils. 12/04/2018 - Table Quiz - two points separated the top 3 teams. 01/12/2016 - Welcome to the New CUS union President. 18/05/2016 - Senior Cricket team fall short in league final. 09/03/2016 - 20 year wait ends for First Years! Photos from the 2019 Annual Dinner held on Friday 12th April Thanks you to Louis Maxwell of Maxwell Photography for being photographer at the event. CLICK HERE ... More! Booking for the Annual Dinner is now open. Strong bookings have been received from 1974 / 1979 / 1989 / 1999 Anniversary years We'd like to thank the following sponsors for their con ... More! Paul Quilligan (class of 1965) passed away on Friday morning last. Paul was an active supporter of the union regularly attending the annual dinner and lunches. Paul who was an accomplished t ... More! The CUS Rugby SCT continued their winning ways with a comprehensive win over what was considered to eb a very strong Temple Carrig team (Godfrey Cup winners 2017) at Donnybrook today. CUS 30&nbs ... More! The following are upcoming Rugby cup matches for CUS. The team would love the support of past pupils at either or both matches. Monday 21st January: Fr Godfrey 2nd Round - CUS JCT vs The Kings ... More! A great start to 2019 has been made by CUS Rugby and it shows that the new coaching set-up is already delivering results. 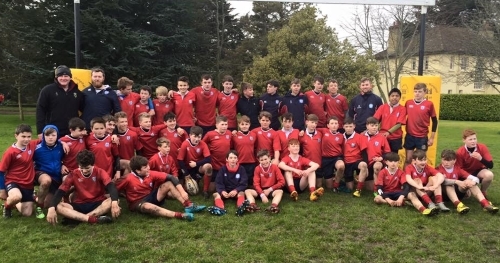 Today (Wed 16th Jan) CUS beat High School 24-20 in Vinnie Murray Cu ... More! This year's table quiz will be on Thursday 28th February in Toners Pub on Baggot Street. (1st floor Function Room) Quizmaster to be announced. Capacity is 20 teams of 4, so booking is advised - em ... More! It is with sadness we inform you of the passing of Michael Keenan, Class of 1965. Michael was the younger brother of the late Fr Bran Keenan SM and was a very active supporter of the union, esp ... More! Sean Scrivener (Class of 99) RIP. It is with sadness we inform you of the death of Sean Scrivener of the class of 1999. https://rip.ie/death-notice/se%C3%A1n-scrivener-castleknock-dublin/370731 ... More! 15 November 2018 - A Message from new union President. It is an honour to serve as the union president and to represent an estimated 4,000 CUS past pupils out there. I would like to thank our outgoing president John Cranfield for the ... More! At the AGM of CUS union on Monday 5th November, Peter McAuley (Class of 86) was elected CUS Union President. Peter has been on the committee for over 10 years and his primary role has been ... More! It is with sadness we inform you of the death of Michael (Mick) Moroney (elder brother to the late Al). Late of CUS (Class of 1956), UCD & Landsdowne. Mick was a great supporte ... More! 16 August 2018 - Annual Mass for deceased staff & past pupils. The annual mass for deceased past pupils and staff of CUS will take place in the oratory of CUS on Sunday October 14th at 5pm It will be celebrated by Fr.John O'Gara SM ... More! Upcoming events of the Union Mass for Deceased Staff & Pupils Mass for deceased staff and past pupils of CUS will take place on Sunday 14th October at the Oratory in CUS at 5pm U ... More! The recently formed CUS union Benevolent Fund is being named officially as the St. Peter Chanel Fund. St. Peter Chanel is the patron saint of the Marist Order and was considered to be "Gent ... More! It is with sadness that we inform you of the passing of Des Daly - class of '65. Desmond Daly, (late of Lower Kimmage Road, Terenure, Dublin 6. )., died peacefully on Tuesday 20th June, surrounded b ... More! Dear Past Pupils, You are cordially invited to "THE RONNIE DELANY SMILE RUN” on Thursday 31st May @ 12pm in Trinity College. There will be a reception afterwards in the Trinity Pavilion. This pro ... More! The Union's Spring Lunch takes place next Friday May 25th at Milltown Golf Club. Time 1pm - Lunch bell 1.15pm. Our guest speaker is the inimitable Mick Quinn - former Irish internati ... More! 12 April 2018 - Table Quiz - two points separated the top 3 teams. Good turnout last night (Wednesday 11th April) for the table quiz. Excellent questions courtesy of our quizmaster Jeremy Kinsella and with 2 rounds to go there were still 5 teams with a good chance ... More! 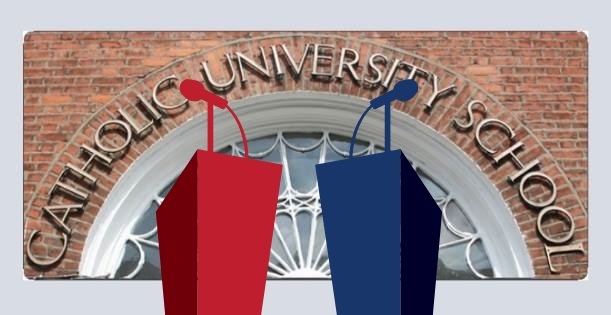 Past & Present Debate next Wednesday March 7th at 7.30pm. This was a regular feature of the union calendar and it is being revived for the 150th Celebrations and it is sure to be an e ... More! Cancellation of Annual Dinner due to Probable Disruptive snow... To all intended attendees of our Annual Dinner I have been reviewing the ongoing weather forecasts over past number of days. Unfort ... More! The CUS union depends on membership fees to continue and progress its work. We are now progressing a membership drive hat will have several benefits for those who join. 1 - Reduced me ... More! 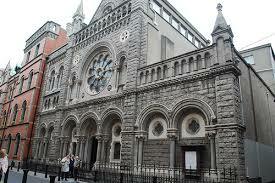 There will be mass in Clarendon Street Church to celebrate 150 years of Education by CUS. It will be officiated by the Archbishop & Fr McAnaney sm European Provincial followed by a recept ... More! December Friday 1st - Union Event - Christmas Lunch Milltown Golf Club 1pm Thursday 7th - School Event (Past Pupils Welcome)- Christmas Mass Clarendon Street ... More! The CUS union AGM was held in the school library on Monday 6th November. Full report to follow. Committee Members 2018 Joh Cranfield - President Peter McAuley - Vice Presi ... More! The CUS union AGM takes place on Tuesday the 6th of November at 6.30pm in the school library. We would welcome new committee members to join the Union and all CUS Union members ... More! The annual mass for deceased staff and pupils of CUS will be held in the school on Sunday 22nd October at 5pm. This is a very special event in the Union's calendar and is organised by Frank Scot ... More! A superb time was had at the annual dinner on 31st March last and we thank our guest speaker, Minister for jobs, enterprise and innovation, Mary Mitchel O'Connor. for attedning. Here's som ... More! 1 December 2016 - Welcome to the New CUS union President. At the union Agm held on Wednesday 23rd November, John Cranfield was elected President of the Union for 2017 and takes over from Glen Killane. We wish John the very best in his new post and ... More! The CUS union Annual Christmas Lunch will take place on Friday 2nd December at Milltown Golf Club. To book a place, please call Neil Noonan at 087 2557244 or email info@cusunion.ie ... More! It may be a few months away, but we are delighted to announce a new venue for the Annual Dinner especially as 2017 celebrates 150 years of CUS. Our new venue is the Alexander Hotel, Fenian Street. ... More! 18 May 2016 - Senior Cricket team fall short in league final. Senior cricket team reached league final after 180 run win over Belvedere on Monday. The final was played in Merrion CC at 2pm yesterday and CUS were up against a very strong St. Andrews team ... More! Photo's from the annual dinner can now be viewed using the link to Maxwell Photography. Password = CUS http://maxwellphotography.photoshelter.com/…/G0000iSSdPO7A6… ... More! 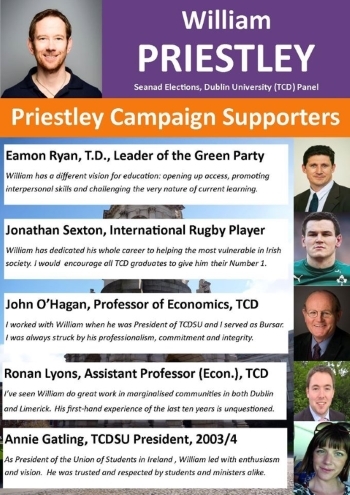 CUS past pupil, William Priestley (1988-1998) is putting himself forward as a candidate in the TCD Seanad election. Since leaving CUS, he studied in both Trinity College and Notre Dame, Ind ... More! The CUS union is delighted to announce Eamon Dunphy as the guest speaker at this year's annual dinner. Eamon will bring his wit and thoughts on both politics and sport - in particular Euro ... More! 9 March 2016 - 20 year wait ends for First Years! Thursday 3 March: First Year A win Central League for the first time since 1986. Hard fought victory over Gonzaga 5-0. Bs lost narrowly to St Gerards 22 - 19. Well done lads. ... More! CUS Hamper Fund appeal. Many of you may fondly recall time spent collecting food donations house-to-house around Dublin. While this particular method of hamper production has been made redundant ... More! 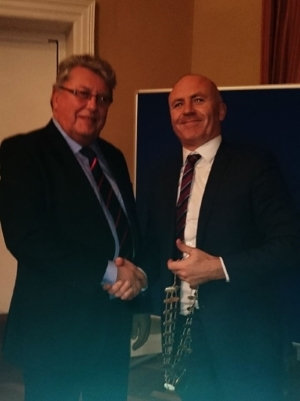 At the AGM of the CUS union on Monday 9th November, Glen Killane (Class of 1990) was elected president of the union.Pictured is outgoing president Stephen Tonge handing over the chain of office t ... More! The annual mass for deceased pupils takes place at 5pm on Sunday 18th October in the Oratory at CUS School. This is always a very special event of the union and remembers the many past pupils wh ... More! Presidents Prize Golf outing takes palce at Milltown Golf Club on Thursday 16th July Tee times from 2pm to 4pm. 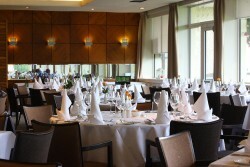 Dinner afterwards in the Club House Restaurant at Milltown. Cost € ... More! 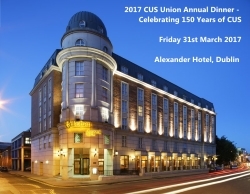 The CUS union annual dinner takes place on Friday 27th March. This year the dinner will feature George Hook and the RTE Rugby Panel with a live discussion and Q&A session. Venue – ... More! The AGM of the union was held in November in the school and we welcome Glen Killane as the new Vice President of the union. We also welcome new committee members, Luke Trench, Diarmuid O’hU ... More! The Annual Table quiz will take place on Thursday 26th February in Railway union. Please see events page for further details and updates. ... More! We are revitalising the CUS Business network and wish to categorise the many businesses and professional services that are owned / operated by past pupils of the school. We will be charging a no ... More! CUS Rugby was featured on six-one yesterday evening. Here’s a facebook link to the piece. https://www.facebook.com/video.php?v=1071020639590949 ... More! The SCT beat Pres Bray 25 – 5 on Wed 19 Nov last to finish second in their section of the league. This qualified them for the Senior Cup proper and they will play CBC Monkstown at Donnybrook KO ... More! A Game of Two Halves CUS 18 Templeogue College 8 January 16 @ Railway union RFC Almost perfect weather greeted the CUS SCT when they started their cup campaign against Templeogue College ... More! update on the Philippines Project February 2013 This year there has been a new innovation to the Philippines Project. Following a lot of preparation, there are two groups travelling to the ... More! February 6th 2013 Success at Leinster Schools Cross Country Well done to the Senior Cross country team who finished second overall in the Leinster Championships held at Santry today. Congratulation ... More! Fr Godfrey Cup Semi-Final St Patrick’s Classical School, Navan 13 CUS 8 January 29th 2013I know it’s a cliché but the JCT can be rightly proud of their battling and spirited performance today ... More! Fr Godfrey Cup Second Round: CUS 27 Pres Bray 5A very good victory today for our JCT at Terenure Rugby club. Led by captain Sam Butler we ran out comfortable winners where the class of our backs was t ... More! CUS SCT lose to St Andrew's 11-0 Jan 10th 2013 Report by Stephen Tonge. CUS 0 St Andrew’s College 11 Bad news today as unfortunately we lost our SCT match to St Andrews (Vinnie Murray Cup Firs ... More! Friday 30th March 2012 Congratulations to the Present golf team who defeated the Past Pupils team at the Grange Golf Club. Captained by Andrew McEvoy (6th year) the pupils won by 10 points. The ... More! Click here to read union Newsletter January 2012 (PDF) ... More! New union Constitution adopted at E.G.M. on 17th January 2012. Enquiries to: info@cusunion.ie ... More! On Sunday, 11th December 2011, Archbishop Diarmuid Martin was the main celebrant at our annual school mass in Clarendon Street church. He spoke of the need for personal integrity at this time an ... More! © 2018 CUS Union. All rights reserved. Cusunion.ie enable cookies to allow you to login to our site and to improve your customer experience. Under EU directive we must inform you that we use them.